One woman kept me safe until I was old enough to keep myself safe. Another woman keeps me sane so I can be a good father. This is what moms do. They give all they have to make sure their children breathe, smile, and succeed. Their reward, near as I can tell, is the joy of being a mom. Sorta funny how that works, huh? I’m not much of a gift-buyer. Below you’ll see the gifts I gave to my wife and mother. The first is a video of what it’s like around here when my wife is gone. 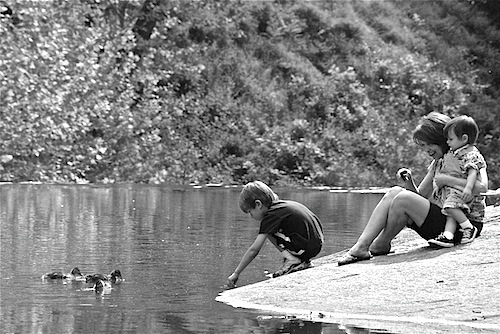 The second is a picture of my mom smiling genuinely as she sits with my boys by the Reedy River. Happy Mother’s Day to all the good moms out there. And thank you. Waiting for Mom from Brad Willis on Vimeo. Interesting how Mother can be used in so many interesting contexts.